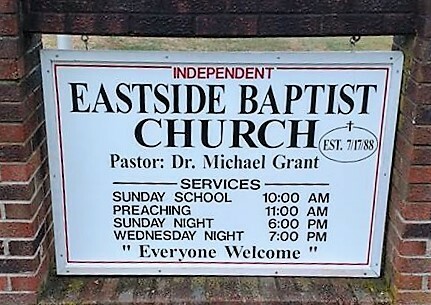 Welcome to Eastside Baptist Church. I want to encourage you to browse our website and to attend any or all of our services. We are a country church that has a heart for the Lord and to serve people. I am sure a friendly welcome awaits you. Also, I encourage you to keep visiting our website as we plan to build this slowly and add many features that will let you enjoy every facet of our services at Eastside. We are taking our time, so we can do it correctly and better serve the needs of those who visit our site and attend our church. Enjoy your time and hurry back. If you are in need of prayer of have any questions, please feel free to contact us as we would love to help. God bless you.